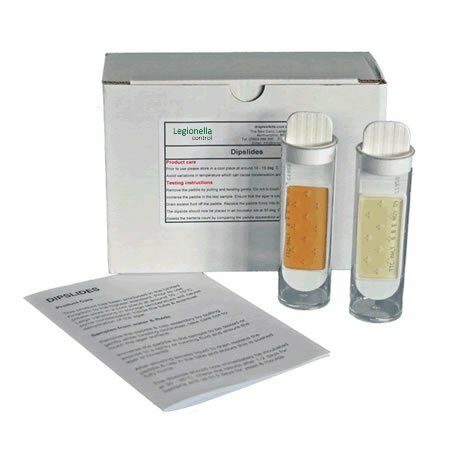 Legionella Control Internationals high quality dip slide test kits allow users to conveniently measure and monitor bacteria and microbial activity within a water system to determine whether that system is under microbiological control or if it represents an increased risk and so requires corrective action to be taken. Dip slides are the most common method of measuring and monitoring microbial activity within water systems including cooling water systems and cooling towers in particular. What is a Dip Slide? Our dipslides comprise a small flexible plastic paddle held within its own sterile plastic container. The surface of each dipslide paddle is carefully coated with a specially selected sterile nutrient agar. This agar coating acts as a nutrient on which microorganisms will grow to form visible colonies. It is the growth of these visible colonies, when compared against a chart, that is used to indicate the number of bacteria in the water sample, expressed as colony forming units per millimetre (cfu/ml). Once the dipslide has been “dipped” in to the sample water it must then be returned to its sterile plastic container and placed into an incubator for a minimum of 48 hours, usually set to 30oC. The incubation period and temperature must be the same each time the test is performed. A good quality incubator that can maintain a constant temperature throughout this period is therefore essential… more on incubators. During the incubation period bacteria present in the original sample water will grow to form visible colonies which are used to compare against a chart indicating the number of bacteria in the water sample in cfu/ml. Do you need an incubator? The Health & Safety Executive in their Approved Code of Practice (ACOP) L8 and HSG274 guidance documents dealing with the control of legionella bacteria in water systems recommends the use of dip slides to monitor the general activity of aerobic bacteria in water systems. The HSE go on to recommend that cooling system waters should be tested weekly using dip slides and if the water system control strategy is effective, the dip slide counts should reflect a system under control, the counts should be consistently low (<104). If an unusually high result is obtained, the dip slide test should be repeated immediately and, if confirmed, appropriate action taken. Consistently high microbial counts using dip slides should be checked by laboratory-based TVCs. TTC / Malt Extract Allows the convenient enumeration of aerobic microorganisms (TVC) plus fungi, moulds and yeasts in a single test. Suitable for fluids and surfaces. Cooling water, cutting fluids etc. TTC / TTC Allows the convenient enumeration of aerobic microorganisms (TVC). Suitable for general purpose cultivation of organisms which can be obtained from surfaces, fluids or the air. Cooling water etc. TTC / Rose Bengal Allows the convenient enumeration of aerobic microorganisms (TVC) including yeasts and moulds in a single test. Suitable for use in the food industry and is also deal for use in detection of hydrocarbon utilizing micro-organisms found in fuel storage. Suitable for fluids, surfaces and air. Food industry, fuel storage etc. TTC / MacConkey Allows the convenient enumeration of aerobic microorganisms (TVC) as well as the cultivation of Enterobacteriaceae (coliforms). Suitable for fluids, surfaces and air. Food, water, sewage, hygiene etc. TTC / E.coli & Coliform Allows the convenient enumeration of aerobic bacteria (TVC) together with E.Coli, Coliforms and Pseudomonas Spp. bacteria in a single test. Suitable for fluids and surfaces. Multiple applications. PDM / MacConkey Allows the convenient enumeration of Pseudomonas spp. and enterobacteriaceae all in one test for gram negative bile tolerant enterobacteriaceae. Suitable for fluids and surfaces. Hygiene, water etc. TTC / PDM Allows the convenient enumeration of total viable cell count (TVC) of aerobic microorganisms and enumeration of Pseudomonas species. PDM differentiates several species of Pseudomonas to facilitate enumeration of total Pseudomonas species present. Suitable for fluids and surfaces. Hygiene, water etc. For further information about our dip slide test kits, incubators, microbiological monitoring tools and professional legionella control services please call +44 (0) 330 223 36 86 to speak to one of our specialists or send your questions to us here info@legionellacontrol.com. © Copyright 2019 - Legionella Control International Ltd.